Yesterday Blossom asked if I wanted to visit a large op-shop around 20 minutes north of here as she was looking for cheap scrap fabric to use in mock-up baby and toddler patterns she'd been working on. Wise girl, keeping her good fabric for the real outfits she'd make when happy with the final design. I was happy to tag along and we had so much fun browsing the store looking through their large displays of books, dvds, vintage linens, craft supplies, books, furniture, and sheets. Bloss found two beautiful queen size cotton percale sheets in perfect condition for a few dollars and these will give her plenty of fabric for the practice dresses and rompers she's working on at night when Cully May is asleep! 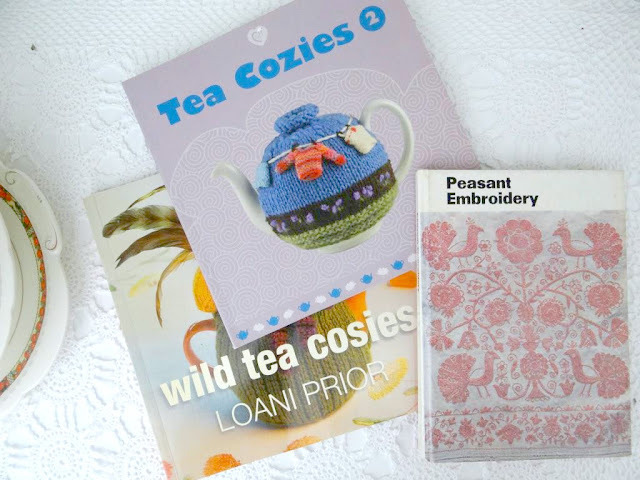 I found two knitted tea cosy books which thrilled me because last weekend I was combing the internet for just the 'right' tea cosy pattern and still hadn't come across one that I really felt inclined to knit, but now I have two books filled with choices. She also pointed out a box of old linens, placed high on a shelf and labelled incorrectly so I doubt many people would have taken note of it. 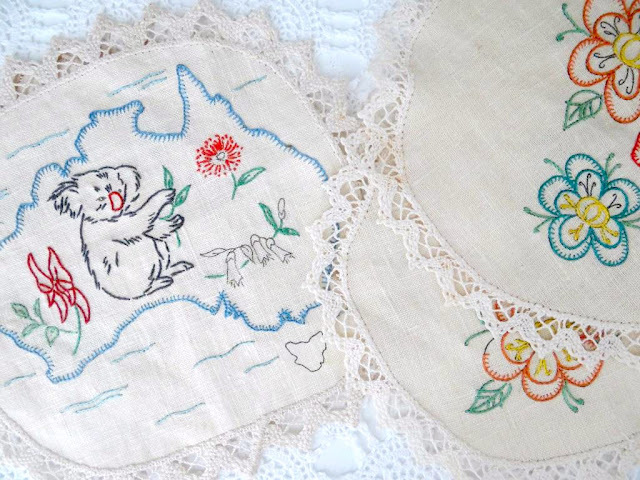 It was filled with embroidered treasures, and all a token 50c each. ...but the interesting thing was that apart from the four pieces in the photos above all the others I found were about 90% hand embroidered and never completed. I studied the stitching and am quite sure they've all been embroidered by the same person, so I wondered why put in so much time and effort only to stop with about 10% of the design left to stitch? On one piece I'd not question this, but on so many? All of the doilies are Semco designs, pre-stamped on linen with pretty crochet cotton edging and I've decided to put them away until one day when I can complete each one, even if that's a decade from now. It just seemed a shame to leave them there 'undone'. The stain on the peacock doily will need to be removed but I'll go gently with that and try hand washing in pure soap first. ...and then I have a few episodes of Father Brown to catch up on while I stitch. 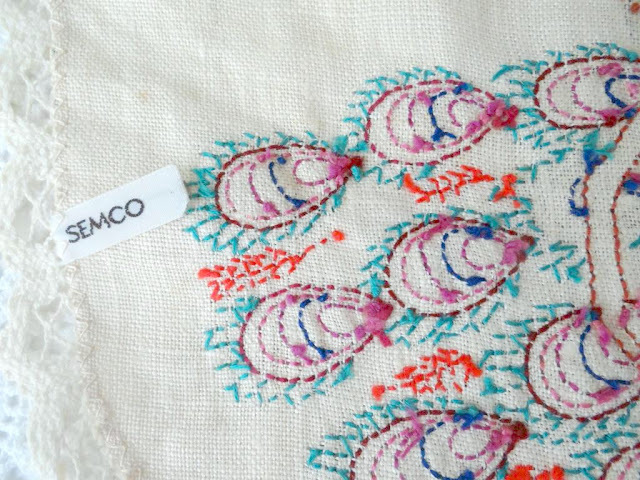 Have you found some vintage treasures recently too? I love old embroidered doilies and cloths, Jenny. My grandmother had a chest filled with her work, and the work of her mother too. 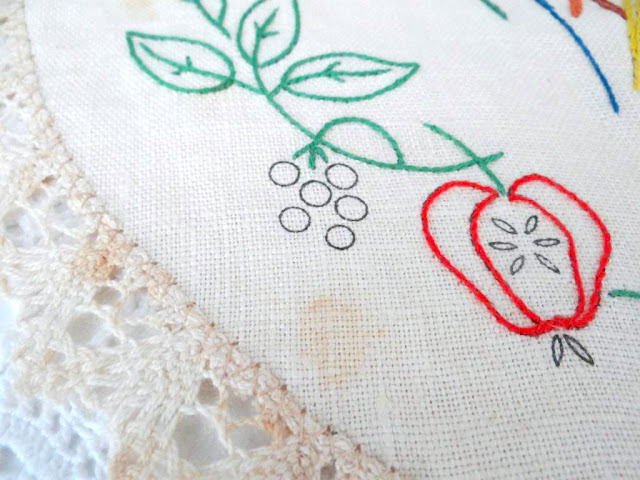 I used to love opening a heavy wooden drawer and taking out the beautiful stitchings to look at. A couple of years ago, my mother gave me a tablecloth and six napkins that had been embroidered by my great grandmother. I treasure them so! 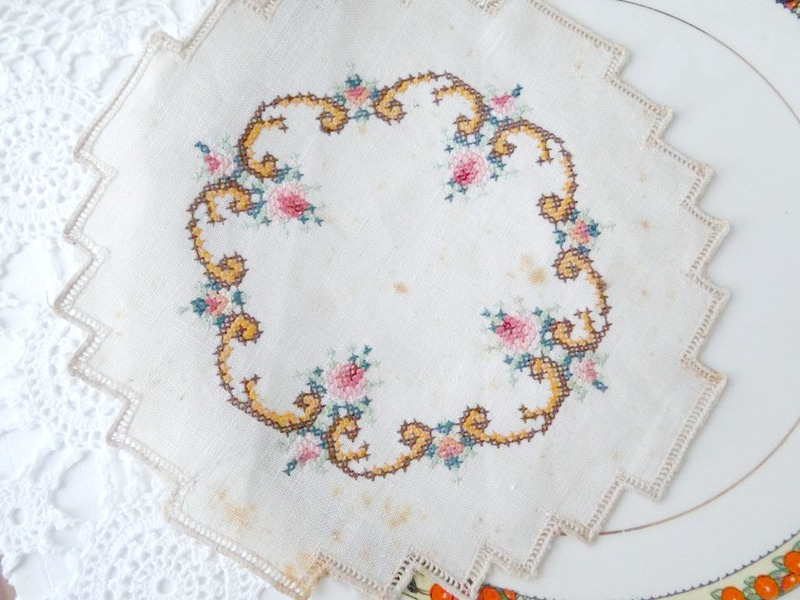 Are you going to finish the stitching on the doilies or leave them for others to guess their stories? If only those gorgeous doilies could tell us why! Wish op-shops near me had linen, or maybe I don't shop on the right day! 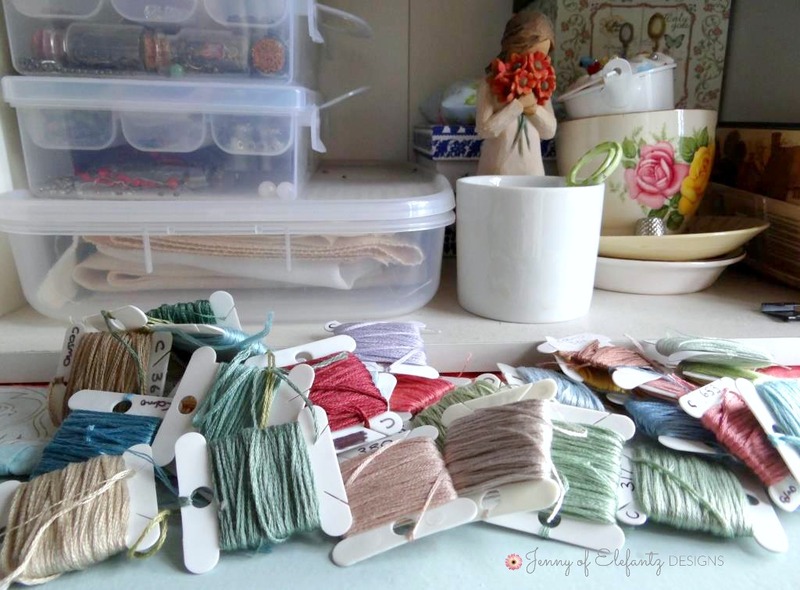 How do you store your embroidery threads, I have mine in the floss box available at habadashery shops all in numerical order, just today I decided I need a new box! hope you are feeling better and enjoy Father Brown, he is one of my favorites too. What a fantastic find for you and Blossom. I love going to thrift stores. One of these days I will make a quilt out of my finds. It will be similar to one you posted last year (I think). Hello Jenny. Such a magnificent find for you and for Blossom! I seldom look at the doilies, only because I only have a few places to put them and those places are already covered with my Grandmothers doilies. But such a great find for you to have fun with finishing. Have a great day! Hi Jenny: Loved this article. I always look for old doilies both crocheted and embroidered. I have always had a love affair with them. I have many of my Mom's and Grandmother's and an old family friend's - Uncle Jimmy was my Grandmother's best friend. He was a baker and when his wife was ill the Dr. suggested her picking up a hobby. When she had problems with some of the stitches he taught himself to do them so he could help her. 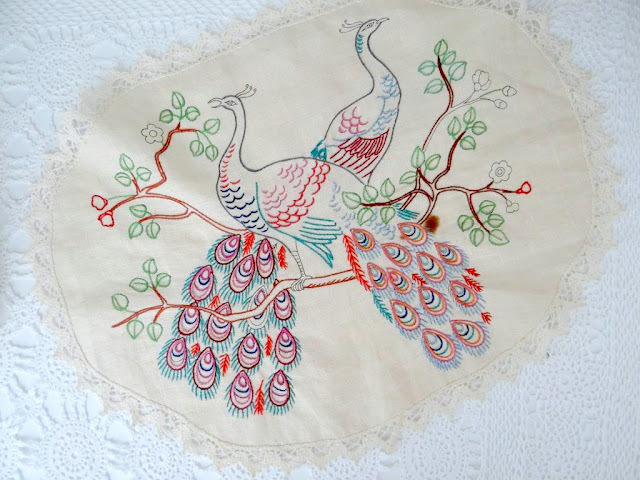 He went on to win awards through out Scotland for his embroidery of birds and flowers. They are so beautiful. My Mom inherited them when Jimmy died. They had no children. He and his wife were wonderful people and I will always remember them. I think of the often. I babysit my grands (6) and when they are a bit older will put them out to use. I do use my Mom's and Grandmother's but Jimmy's are so amazing to be out for everyday use. I hope my grandchildren will treasure them as much as I do. Christine in London, Ontario, Canada. It's been years since I walked into a thrift store or an antique store and found anything wonderful - maybe even a decade! There was a great haul of laces in a shop in California, and nothing since then. Your pieces, finished and un, are a fabulous find! How little it will take to finish any of those. I look forward to seeing what you decide to do with the ones completed. Such lovely pieces! What fun that Blossom is designing children's clothing! I wish her great success with that endeavor. Some of those doilies are just lovely. I wonder if may be the stitching has just come undone due to use and age? Take care if yourself. You are loved! Mmm that's odd for so many to be left unfinished. Never mind it's good for you as I'm sure you'll make some great items with them. Good idea for Blossom to try her patterns out; I loved making summer dresses for my daughter & granddaughter. Glad you're enjoying the Father Brown mysteries it's so good & the 'fifties clothes are great. I'm enjoying the Doctor Blake mysteries. Funny how so many popular telly programmes at the moment are set in the fifties. Sadly Call the Midwife is finished now until the Christmas special but there will be another series to look forward to next year. what an awesome find. I inherited quite a few bits of embroidery from past generations of my family and made a quilt for my grandson three years ago and am now completing one for my grand daughter - due in May. 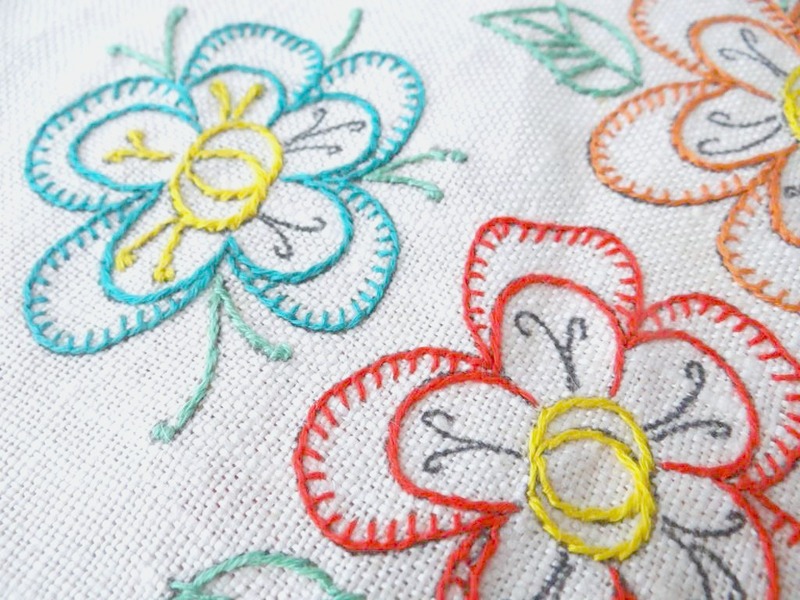 It is such fun working with this old fabric. Perhaps the cat's face will look less mean once it's stitched. 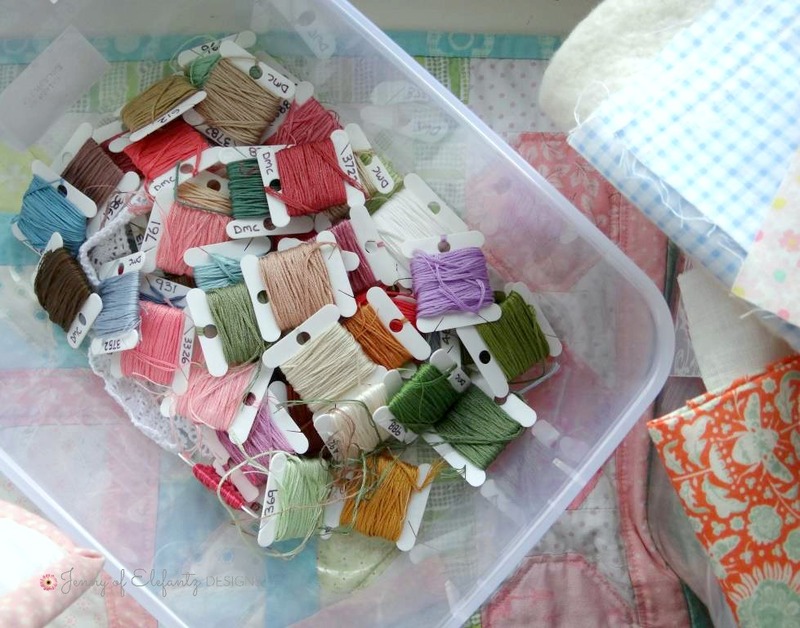 The floss' color and texture may give it a gentler look. What a find! It's odd that they didn't finish when they were so close. At least the cat face isn't finished, so you could put a playful face on her. I did find some old vintage German lace at a vintage store that I've enjoyed using for finishing. The "hunt" is half the fun. 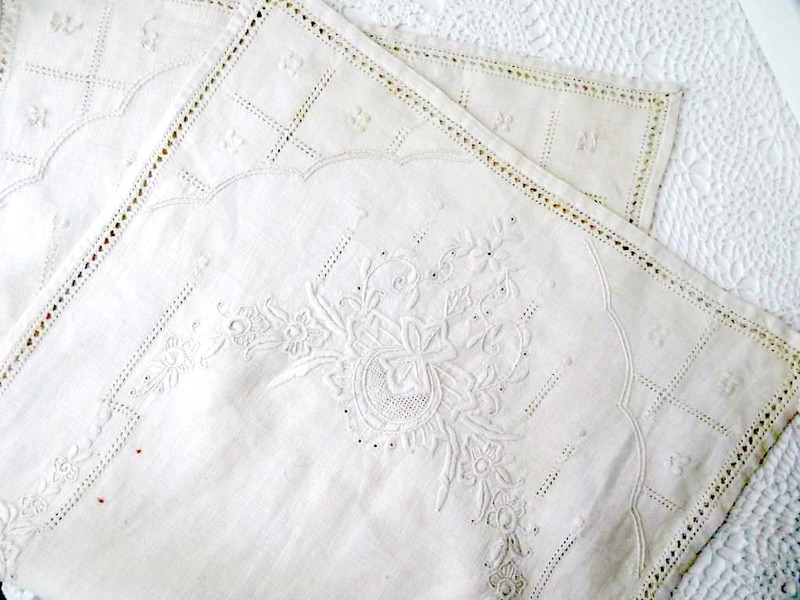 I love rescuing vintage linens!! Looks like you stumbled across the hoard of a serial starter lol. Beautiful. 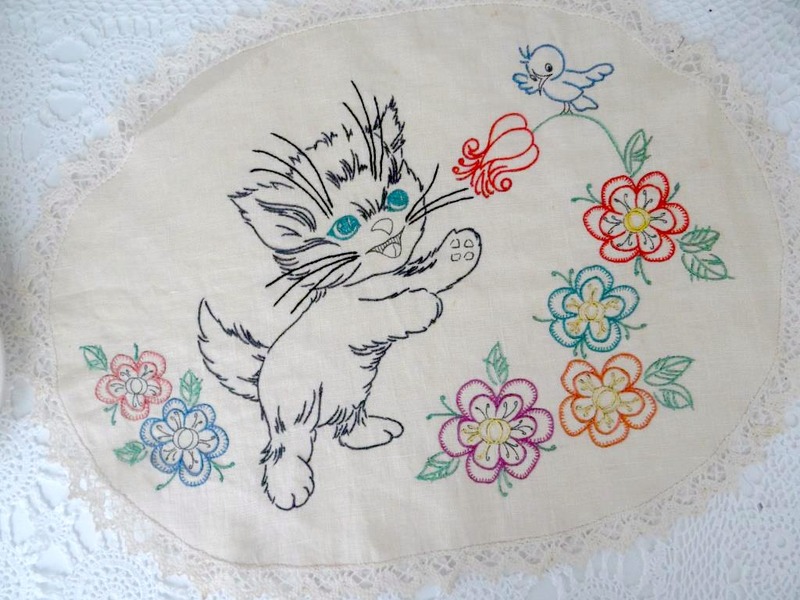 I was given a large unfinished embroidered tablecloth started by my husbands grandmother. 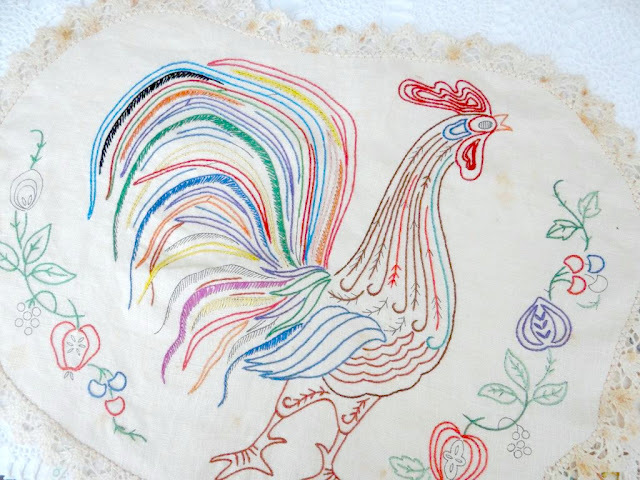 My mother completed the embroidery. It now requires a crocheted edging. I've bought the thread so now just need to decide on a pattern and start. 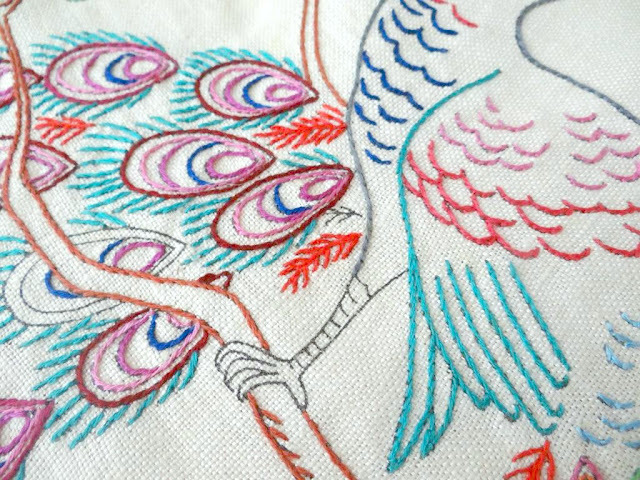 As it's large and the thread is fine, it will take quite some time to complete. I also try to collect a few vintage linens. They are quite hard to find, so I snap them up when I do see them. If they have holes in them, I will cut them to use on my patchwork bags. I love browsing around in Op Shops but haven't done it for quite a while as I was frightened I would buy something just when I am trying to get rid of stuff lol. Love thise doilies. That rooster is such a handsome fellow. Maybe the person who stitched them simply missed those bits or forgot about them . I know I have to check all my projects before I back them or frame them because I have missed bits in the past. Either that or they needed new glasses lol. How do you remove those age stains? I have a few of my grandmother's which need some attention. 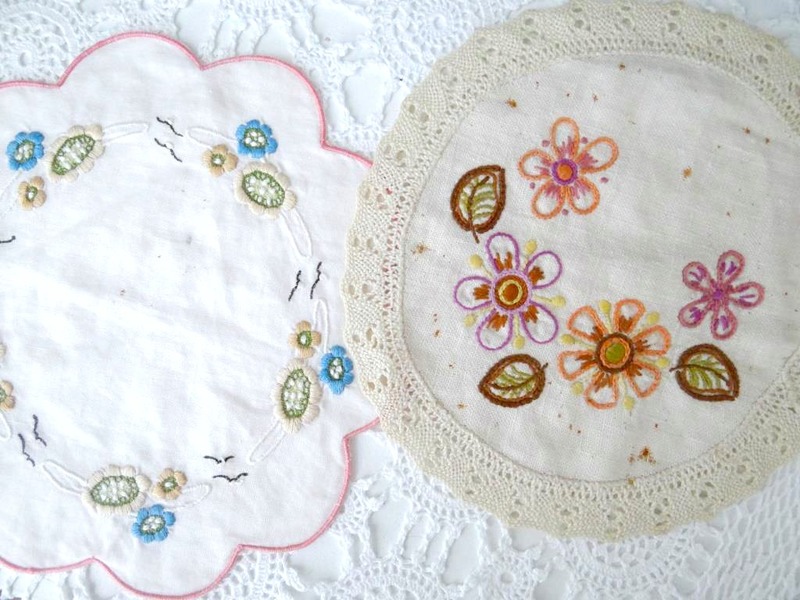 A lovely collection of doilies you have bought. Great finds for both of you! What a wonderful day you must have had together. The best part about his post was the joy you gained from spending shared frugal time with Bloss. A real great example to us all. perhaps they liked to have many on the go to keep it interesting & they didn't get finished due to illness or they might've passed away? & the children or nursing home didn't want them? you will never know but now they have found some love again & will see the finish! what a score with the teapot cozy books! i have been borrowing tea pot cozy books to scan from my local library! well done!